Cockroaches on the kitchen floor. The kitchen and bathroom are the two rooms in the house that cockroaches are attracted to the most. That is because cockroaches are always in search of food and water just like every other living creature, which leads them to your kitchen for a snack. There are several things you can do to get rid of roaches in your kitchen, and make sure that they never come back. The first thing you need to do is choose your weapon of choice and pick a pesticide to put down throughout the kitchen (recommendations below). Then you will need to check for and fill any small cracks or crevices in your home that cockroaches use as entryways. The final step is to clean the kitchen thoroughly, and keep it clean, to deter more cockroaches from coming back. The thing you need to do first is put down a cockroach killer throughout your kitchen. You have several options here but there are differences between them which I will describe. You want to apply the roach killer everywhere you can in the kitchen. For example, along the floorboards, in the cabinets, under the refrigerator, stove, and dishwasher. Basically, everywhere that roaches can scurry you want to make sure is covered with pesticide. Boric acid: This is usually my first recommendation (but not for the kitchen) because it is cheap, highly effective, leaves little residue, and is not harmful to your pets or children. It is a chalk colored powder that comes in a bottle and you just clip off the top and that lets you inject the powder all along the areas that you want to. I like to inject a little along the baseboards of the wall since that is where roaches like to crawl. The drawback is that boric acid powder can be easily moved by wind or foot traffic and doesn’t stay in place for a long period of time. Cockroach gel or paste: Cockroach gel is also extremely effective at killing cockroaches and is actually my favorite cockroach killer for the kitchen. Cockroach gel’s advantage over boric acid powder is that it does not get dispersed as easily (one application can work for a couple months). But it’s drawback is that it leaves a residue behind on whatever surface you apply it to. Some of these gels can discolor your floor with a black or brown mark, which is fine in the garage or basement, but obviously not in the kitchen. So be careful with that. Here is a little trick that one of my readers actually told me about: Apply the cockroach gel to a small piece of cardboard and then slide the cardboard under your refrigerator, put it in the cabinet under the kitchen sink, or wherever. That will save your floors and counters from getting stained. Bait traps: Traps are great if you don’t have a big cockroach infestation, and perhaps if you have only seen a few of them. You can scatter several of them around the kitchen, and they are easy to slide behind the refrigerator and other large appliances. If you have a lot of cockroaches, I would recommend that you go with one of the other two choices, however. Especially in the kitchen where roaches are attracted to the most, you are better of going with gel. In order to get roaches out of your kitchen, you absolutely have to keep it clean. Use a detergent or diluted bleach solution to thoroughly clean all your kitchen surfaces. All along the floors and countertops. Clean inside and on top of the stove. Move your refrigerator and clean in that area as well. 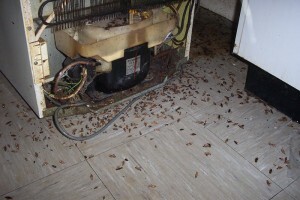 Under the fridge is a forgotten place that can build up dirt and debris that roaches can feed on. Roach feces often accumulate there, as well. And wipe down the inside of the fridge, too. You wouldn’t think roaches could get inside the fridge but often they can. Any residual food or grime can be smelled by cockroaches and it will attract them. I prefer cleaning with bleach because it helps to mask any smells that bring in the roaches. It is a great bacterial disinfectant, as well. Make sure you do this regularly and keep your kitchen clean at all times. If there’s no food or water for them to access, cockroaches will have no reason to come in your kitchen any more. Cockroaches have to get in your kitchen somehow, and that is usually through small cracks or crevices in the structure of your home, or a door that does not seal tightly shut. To go the final mile, you need to locate and use caulk to fill these holes. It’s a good idea to go ahead and seal the entire flooring area around your kitchen with caulk. Where the linoleum or tile meets the wall, go ahead and spread a layer of caulk all the way around the kitchen to seal in places where the roaches might get in. This might sound like a big job, but it really doesn’t take that long. Make sure you caulk inside the cabinets and where the cabinets meet the wall, too. Check the doors and windows in your home are properly sealed to keep roaches out. Window and door seals are prone to have small cracks because of their frequent opening and closing. Fixing these will also save on your utility bills, as well as keep roaches out. Following these steps should be enough to get rid of all the cockroaches in your kitchen. It’s really very simple. Just clean the kitchen thoroughly and keep it clean. Use cockroach gel to kill the roaches already infesting your kitchen. The cockroach poison may take several days to start working, but you should start to find dead cockroaches fairly quickly. It may take a few weeks to get rid of all the cockroaches because as the adults die, there are cockroach eggs hatching new baby cockroaches. But the cockroach nymphs will die before they are able to reproduce, ending their life cycle. And hopefully your kitchen will be cockroach free ever after. My mom has a roach infestation, mainly in the kitchen. In the sink, the freezer, and fridge. I’m so paranoid of going to her home. Would roach baits work for her? She has a dog. Sure, Pam, roach bait should work. With a dog, put the bait in places where the dog can’t get to them. I would thoroughly clean the fridge, too. Good luck! Thanks for sharing your blog about getting rid of roaches. I like when you talked about how to keep the kitchen clean and all the other areas where the roaches may be at. I just visited our old house and found a lot of roaches most especially in the kitchen area. I’m interested in selling it so I want it to be on it’s best. As much as I would like to clean it and get rid of roaches, I don’t think that I have the luxury time for it. I will make sure to find a good pest control company to get help. I’m also thinking that there may also be other areas where the house becomes infested with roaches so a professional help is indeed needed. Thanks for the comment, Sharon. Glad the info is helpful. Professional exterminator is the most convenient and reliable way to go if it is in your budget. Good luck with selling your house. Sorry to hear about your new visitors (roaches), Mau. Cardboard boxes are known to attract roaches because they provide dark places to hide and also any type of paper product is a source of food. Wish you good luck with it. Here’s the short story: first saw what looked like an American cockroach on the kitchen floor. Then my husband said he saw the same kind of roach when putting a Costco bag of pears in the fridge (it ran off the bag). The conclusion was that they’re in costco boxes. Then today my husband spotted the same roach running out of the car. Now we’re surprised because we live in a wealthy area and we’re very clean. I thought it wad just a sewer problem. Anyways another site said that if you see one, it doesn’t necessarily mean an infestation and that American cockroaches typically prefer outdoors. We’re assuming this is a Costco box problem. Anyway. I don’t want them making babies in my house! How do i prevent that? Also what about the car? Besides getting it detailed? Btw we didn’t go to costco today so do you think the roach was in there for 2 weeks? I’m thinking the roach probably came from the Cosco box. To prevent the roaches from proliferating, you may use one of the roach control products described in this article. Put some roach killer in the kitchen, car, and wherever else you see a roach. Don’t worry too much about it now, but best to be proactive. Does diatomaceous earth work very well at preventing infestations? I was thinking of putting some around baseboards in the garage, but I’ve never worked with it before so I’m not sure if that’s a good idea. I was also thinking of putting it along baseboards in the basement area and then caulking/foaming around it. Will that work? I have children but I don’t have pets. I’ve finished thoroughly cleaning inside/behind the fridge and oven. If I didn’t see roaches or cases/babies behind them, does that mean we don’t have a roach infestation? What was interesting about the 3 roaches we saw was that 2 instances were in the daytime. I thought the roaches like to hide out then! I like the idea of using some sort of gel application behind my fridge and stove, however my concern is calling more roaches out (from wherever!) when perhaps I don’t have a roach problem to begin with. Do you know what I mean? Also, I guess I don’t want to put harmful poison in the car because we’d breathe it in such a confined space. I’m thinking we should get it detailed (even though it’s expensive!) And then put boric acid gel form in there or some sort of nontoxic item in the trunk and under the seat. Happy to help. If you had a roach infestation, it would be quite evident. You would see roach droppings and many roaches. Diatomaceous earth works great around the baseboards and in the basement, but don’t cover it. You can also use roach gel or traps. I wouldn’t worry about the car unless you keep seeing roaches– it is rare to get an infestation there. You may have just carried a couple roaches in your with your groceries– nothing to worry about. Anything you know of that is more natural and safe to use during pregnancy? I don’t think the cockroach control products I recommend are a threat to your baby, as they are only harmful if ingested. Perhaps avoid liquid sprays though as they may be inhaled. But yes, if you want 100 percent natural cockroach killer, use Diatomaceous Earth. I want something home-made to kill the cockroaches in my kitchen. I have a spray bottle of Clorox cleanup in bathroom and kitchen. It won’t kill residually but you’ll not see that roach alive again. It may scurry off but it will die-just be sure to spray low so they have to crawl through it to get away. Half diluted liquid soap like Dawn will also work. Food grade diatomaceous earth is the best child/pet safe residual roach killer but it is messy and needs reapplication every couple months. The food grade diatomaceous earth(DE) is non-toxic to humans and pets. (Some people even ingest some daily for health reasons…but what it does for them I do not know.) Buy yourself a a plant duster (Like for dusting certain products on Rose’s. You can probably find this where you purchase the DE) to dust DE where you want it. DE can potentially kill any insect with a hard exoskeleton as the brains of DE are like shards of glass making cuts in the exoskeleton, thereby drying out and killing the roach/insect. I live in a duplex and this is the only product I used to kill my “creepy crawlies” and it worked. Only downfall is reapplication. (You so need to be careful about inhaling too much DE dust during application–not great for your lungs!) The DE is cost effective and 1 bag lasts a very long time but you must keep it DRY or else it will not work. I suggest storing it in a watertight container or ziplock bag. That’s great advice, Debra. Thank you.